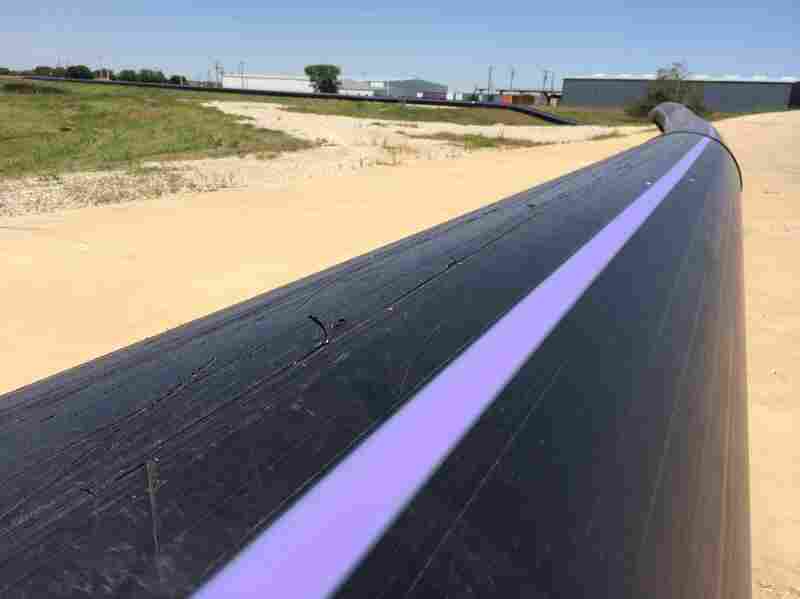 Drought-Stricken Texas Town Turns To Toilets For Water Wichita Falls may soon be one of the first cities in the nation where half the drinking water comes directly from wastewater. It will save water, but some residents find the process tough to swallow. 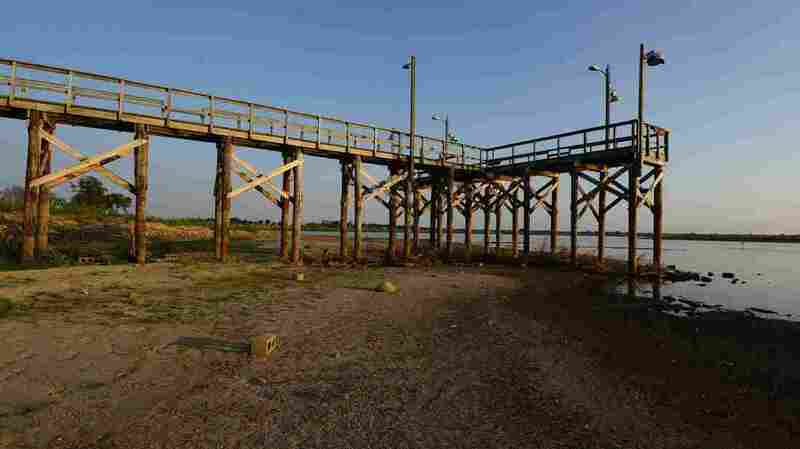 After three years of drought, the water has receded from a dock at Lake Arrowhead State Park near Wichita Falls, Texas. The city of Wichita Falls, Texas, may soon become the first in the country where half of the drinking water comes directly from wastewater. Yes, that includes water from toilets. The plan to recycle the water became necessary after three years of extreme drought, which has also imposed some harsh restrictions on Wichita Falls residents, says Mayor Glenn Barham. "No outside irrigation whatsoever with potable water," he says. "Car washes are closed, for instance, one day a week. If you drain your pool to do maintenance, you're not allowed to fill it." Barham says residents have cut water use by more than a third, but water supplies are still expected to run out in two years. So the city has built a 13-mile pipeline that connects its wastewater plant directly to the plant where water is purified for drinking. That means the waste that residents flush down their toilets will be part of what's cleaned up and sent back to them through the tap. Wichita Falls constructed a 13-mile pipeline to deliver the city's wastewater to a purification plant. For some citizens, that's a little tough to swallow. "I think it's gross," says Wichita Falls resident Marissa Oliveras. "I mean, it's recycled wastewater that we could possibly be drinking." Oliveras isn't the only Wichita Falls resident who says she plans to switch to bottled water. At Gidget's Snack Shack downtown, customer Kira Smith also plans to spend extra money on bottled water when the recycled wastewater begins to flow. "The thought of it definitely grosses me out," Smith says. "I'm sure that they would clean it and filter it up to standards, but I think just the idea would be — it's sort of a mindset kind of thing, you know what I'm talking about?" The mayor insists the water will be clean and safe, and the city has undertaken a massive education campaign to explain the science behind the process, known as direct potable reuse. Several other Texas cities are pursuing the process. One small hamlet started recycling wastewater in 2011, but not on the scale that's being done here. Some people unceremoniously call it "toilet-to-tap," but the city official overseeing this process, Daniel Nix, says that's not really how it works. "The vast majority of water that enters a wastewater plant did not come from a toilet," he says. "They come from sinks, and bathtubs, and washing machines and dishwashers." Wichita Falls has embarked on a campaign to educate residents about the system of purifying wastewater. Wastewater in Wichita Falls is currently treated and then emptied into the nearby Big Wichita River, where a natural cleansing process takes place. That water is carried downstream to a large reservoir, where other cities treat it further before drinking it. Nix says they'll re-create that natural cleansing process inside the plant. "Inside the treatment plant, we speed those processes up," he says. "So rather than wait several weeks for ultraviolet radiation from the sun to disinfect or kill bacteria, we do it in the plant using chlorine. It takes a matter of minutes to do it instead of weeks." Nix shows off the equipment that will blend the treated wastewater with the city's dwindling supply of lake water. The 50-50 mix will get more chlorination, advanced filtering and reverse osmosis, which will eliminate unwanted minerals, bacteria and parasites like giardia. At Gidget's Snack Shack, owner Julia Spence says she trusts the city. She has to. "You do have to give them the benefit of the doubt, because they have done their research, they've spent a whole lot of money, they've tested, tested, tested," she says. "This is where I was born and raised, and I'm not ready to close my business and pack up and move." Barham says as soon as the state gives the go-ahead, he plans to take the first sip of the recycled wastewater. He's betting that most of his neighbors will also raise a glass and drink.